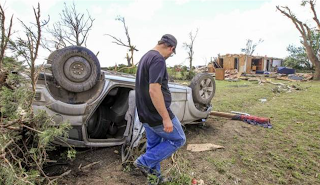 MSE Creative Consulting Blog: How Good or Bad Was Yesterday's Tornado Forecast? For consistency with what the general public is hearing, I tend toward using the NWS's tornado forecasts unless I have a significant disagreement like Tuesday, when I posted my own (with a post-forecast validation, like the one I am writing now). FYI: AccuWeather does not do tornado watches or warnings for the general public. That is the job of the NWS. Our warnings are for business and enterprise clients. The way this works: I make a general severe weather forecast based on tried and true techniques and then I look at the computer models. 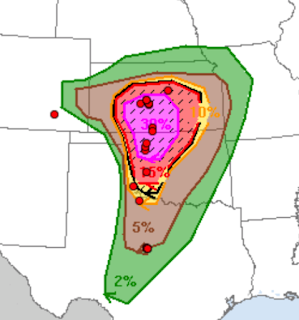 My forecast indicated a generally high risk of tornadoes in Kansas and Oklahoma. The computer models in the pre-dawn hours Thursday were terrifying: huge, long-track tornadoes hitting population centers. Still, there was some doubt. Some of the forecast models Thursday morning showed "too many" thunderstorms for many violent tornadoes. If there are too many storms, they "compete" with each other for unstable air and become less prolific tornado and hail producers. Here is a paragraph from yesterday's forecast. So, SPC came up with a great compromise. A high risk but the lowest probabilities that trigger a high risk (they can go up to 60%). I was very confident there would be tornadoes, my question was severity. So, I (as always) tried to educate people what to do to prepare regardless of where or how strong the tornadoes might be. If your home is destroyed by a tornado, you probably don't care about its scientific intensity. How was the forecast? The red dots are tornado locations. While none of these were huge, violent tornadoes (think Greensburg or Joplin), there were many tornadoes in exactly the area where they were forecast, with the exception of the southeast Colorado tornado. Regardless we need to reach out to those who were affected by yesterday's storms. "Wichita Eagle" photo of Great Bend-area man looking at his destroyed home and car from yesterday's tornado. I believe that my prayers and the prayers of many were answered yesterday. No widespread damage; no serious injuries. I regret that events were postponed in Wichita and OKC and throughout the region without a tornado occurring but it sure beats the alternative! Mike: Are you sure this damage photo is from the 18th and not the 16th?